In cell biology, a vesicle is an (often spherical) assembly of amphiphilic molecules (usually proteins and phospholipids), and is typically sized between 30 nm – 100 nm in diameter. Vesicles are often classified by the type of interaction they are involved with. For extracellular vesicles (or exosomes), this is usually intercellular signal transmission. A particular example of exosomes is synaptic vesicles, which transmit signals between neurons (average size: 40 nm). In a paper entitled “Structural basis of synaptic vesicle assembly promoted by α-synuclein1” the authors investigate a specific protein which forms fibrillar aggregates and is implicated in Parkinson’s disease. A double-anchor mechanism as illustrated in the figure on the left (taken from the publication under creative commons license from Figure 3 in: Nature Communications 7, Article number 12543, doi:10.1038/ncomms12563) shows the protein pulling together two vesicles before fusion. Modeling has supported the reach of this mechanism at up to 15 nm. In the study, the size of small unilamellar vesicles (SUVs – prepared by membrane extrusion at different pore diameters) was shown to increase after incubation with α-synuclein, with an even stronger effect displayed by a specific mutant. The data are shown in the supplementary information. One of the techniques available to size vesicles (as well as other nanoparticles) is Dynamic Light Scattering (DLS), which analyzes intensity fluctuations in a small amount of sample to obtain the diffusion coefficient and the size distribution of the sample. This technique is suitable for a size range of ~1 nm up to a few microns, and in the above publication, the average measured diameter of particles grew from ~60 nm to ~80 nm or ~120 nm, depending on the type of added protein. This supports the proposed fusion of synaptic-like vesicles, in agreement with results from cryo-electron microscopy (cryo-EM) and stimulated emission depletion (STED) imaging. DLS data were measured with the Malvern Zetasizer Nano. 1) Nature/Giuliana Fusco, Tillmann Pape, Amberley D. Stephens, Pierre Mahou, Ana Rita Costa, Clemens F. Kaminski, Gabriele S. Kaminski Schierle, Michele Vendruscolo, Gianluigi Veglia, Christopher M. Dobson & Alfonso De Simone. 2016. 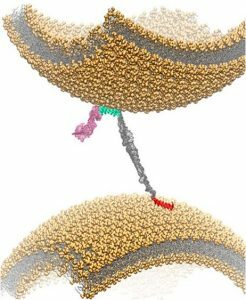 Structural basis of synaptic vesicle assembly promoted by α-synuclein. [ONLINE] Available at: http://www.nature.com/articles/ncomms12563. [Accessed 17 October 2016]. D90, D50, D10, and span – for DLS?